A series of pixellated images reimagining dozens of recent hits as two-dimensional SNES-style releases takes us back to the 16-bit era in style.. 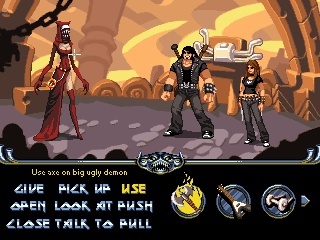 Brutal Legend was a hilarious game, but wouldn't it have been better as a point-and-click adventure, in the same vein as creator Tim Schafer's older releases? Would Bioshock's Rapture be as atmospheric in two dimensions? What would StarCraft look like if it had come out in 1988 instead of 1998? These are some of the questions that one Swedish pixel artist, Junkboy, wants to address. The artist has uploaded nearly two dozen demakes from Swedish magazine Level - pieces of pixel art that give us a glimpse of what modern videogames would look like on eight or sixteen-bit consoles - to the online message board Way of the Pixel. This series of mock-ups makes one wonder what this generation's hits would be like without all of the frills of modern technology. If designers had come up with the same raw concepts ten or twenty years ago, what sort of games would have emerged? Without 3D, surround sound, and realistically rendered visuals, would the games be just as fun? In my opinion, these demakes are beautiful enough to make me physically crave playable versions, but Junkboy takes a more humble stance on his work, posting that "many of these were made quick and dirty (relatively speaking) in order to make deadlines, so they're not all that pretty to look at." He adds that he released them so that they wouldn't "just gather dust" on his hard drive. He is looking for feedback, positive or negative, and I suspect that many of you will have fun simply trying to guess which game each image represents.